sense of wonder… ​which is really at the heart of all good Science Fiction and Fantasy"
Book jacket illustration for the Arthur C Clarke novel, "Expedition to Earth"
Illustrator of Science Fiction and Fantasy. I love natural history too... in fact, that's where most of my inspiration comes from. I have also worked in the Games Industry producing Concept Art. many original works for sale. I hope you enjoy having a browse around the galleries. 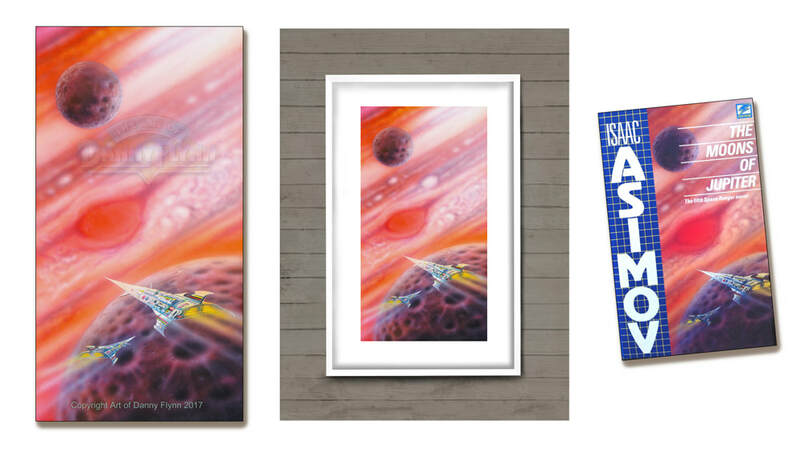 I still have the four original paintings as illustrated for Isaac Asimov's Space Ranger series. The originals of these paintings will be for sale once I finish them. CLICK HERE to view more paintings in progress. 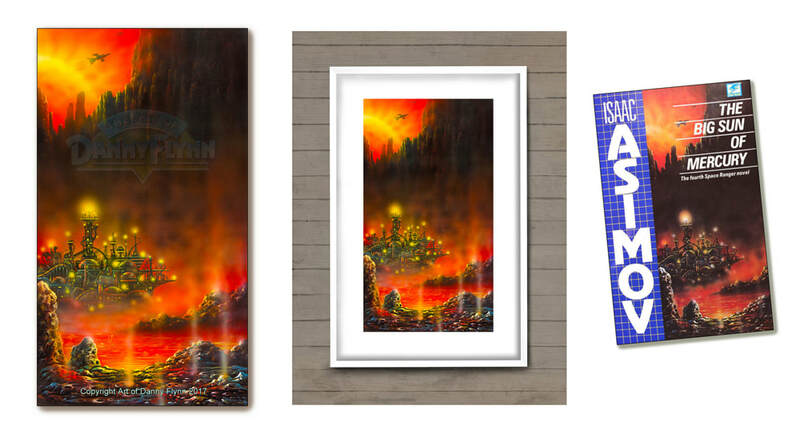 Giclée print is the term commonly used to describe a fine art digital printing process, which combines pigment based inks with highest quality paper to achieve prints of superior archival quality, light fastness and stability. 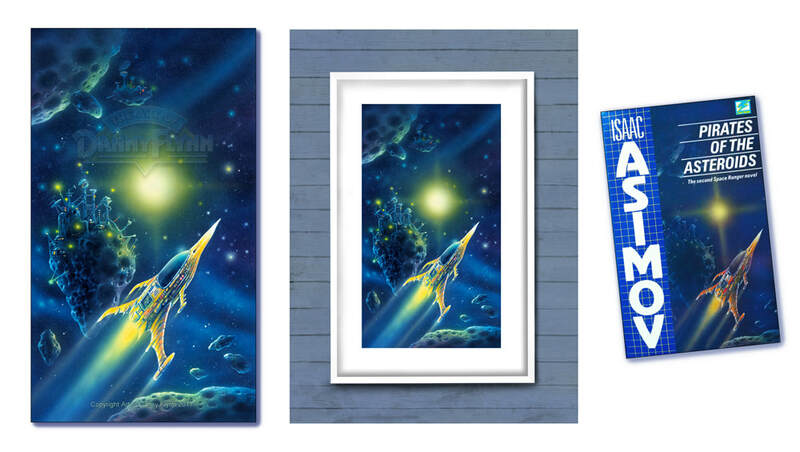 The quality and clarity of a giclée print is an almost exact reproduction of the original painting. The word giclée is derived from the French verb gicler "to spray". 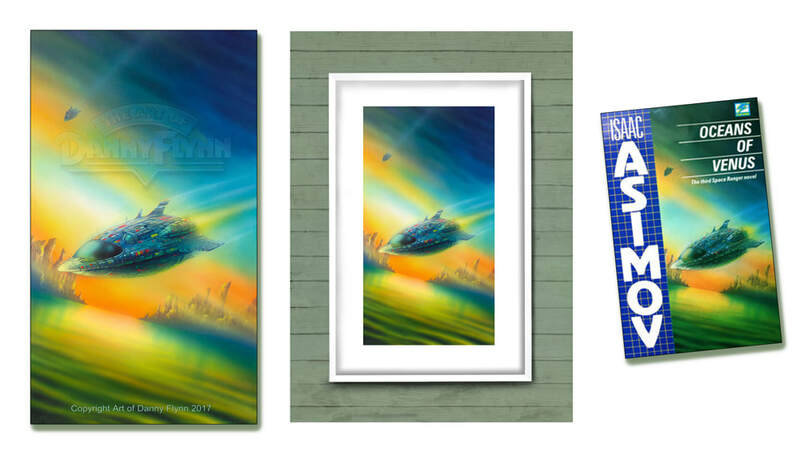 ​Images are printed onto watercolour décor 245gsm highest quality archival and fade resistant stock, with a 300dpi resolution... if you understand what all that means? In essence, I guess it's the next best thing to owning an original. How long does it take for a print to arrive? It depends where in the world you live, and how amazing your postman is. If you live in the UK, it should only take a few days. Anywhere else in the world, please allow a week to ten days. Outside of Earth, then allow a month or two. Outside our Solar System, then best allow a couple of light years. Are any of your originals for sale? Yes, they are... some of them. If you look in GALLERIES & SHOP above, then follow the ORIGINALS FOR SALE link. I also take on private commissions. If interested, please click on CONTACT above. Absorbing all this fantastical literature, my nature art started to change somewhat and become a bit more weird. Birds I drew would have two or maybe even three heads, and be the size of castles. Clusters of shells would become ethereal space cities. Frogs and toads would become long and s t r e t c h e d. And so it began... my journey into the exotic colourful visions of the mind, where one can have great fun exploring the mystical and the other-worldly... a journey that I still walk I'm pleased to say. You draw... lots. You look at the work of other artists. You join an Art Society and befriend other creative people. You always have a sketchbook on the go, take it with you everywhere. You leave your home town and go to Art college. There is no "proper" clearly defined route to becoming an Artist. It is more a way of life than a profession. As well as the advice above, all I can say is... do the art you love the most. By all means, step out of your comfort zone from time to time, but strive towards being in a position where you are creating work you enjoy. To get there though, may just take time and a lot of hard word and practice. who are your favourite artists and INFLUENCES? Difficult question as I love most art, and greatly admire those who follow their creative dreams... whether it be painting, music, acting, being a poet or whatever. When time allows I will come back too this question and name some of my favourites. I think I am, yet many disagree. Yes I have... honestly! I have seen a UFO... or should I say UFO's. Eight years ago, on the 23rd July, I saw some "other-worldly" objects in the sky. To this day I'm not really any wiser what they were. I was driving through Northamptonshire, near the town of Rushden. It had been a lovely summer day, and was still quite light, even around 9.30pm. As I drove along the dual carriageway, I happened to notice to my right across the fields, a bright orange object floating just above the horizon. Obviously I needed to keep my eyes on the road ahead, even though there was not much traffic. I kept glancing through the window, intrigued as to what the orange object could be. It looked like a giant belisha beacon. Soon enough, I pulled over into a lay-by, hoping to better observe whatever the object was. However, when I looked again, there were now TWO objects! Where had the other one come from? Meanwhile, cars were driving past me. I was surprised no one else was stopping to get a better look at these strange glowing lights. So there I was, by the side of the dual carriageway watching in fascination, two bright orange objects. “What the hell are they?” I'm wondering. The two orbs began slowly rising higher into the sky. Next it gets more weird. A third orb suddenly appears, as if it has just "blinked on". There are now THREE orange balls/orbs, pulsating softly, hovering against the evening sky in an equilateral triangle formation. As you can imagine, I'm trying to rationalise in my mind what I'm seeing. Am I scared? Not really. Ok, a little bit. Being an artist of science fiction and fantasy, I am well used to thinking up the strange and the wonderful, but this is real life. "Who is ever going to believe me when I try and explain this?" I am thinking, as I continue to watch the orbs. They are not moving, and eerily, there is no sound coming from them, not even a faint hum. One of the orbs breaks formation, then a second orb moves off in the opposite direction. Suddenly, they both disappear, and "blink out", gone! The remaining orb moves slowly to the right, faster, then faster still shooting across the sky. "Nothing can fly that fast" I am thinking, but it just did! I look all over the sky, a little sad that the display is now over. I then notice in the distance a faint light which is getting brighter and brighter, and larger. Suddenly there is another light, then another... then yet another! There are now FOUR orbs. High in the sky, on this warm summer evening, I am watching four mysterious orb shapes hovering above the town of Rushden. The orange lights blink on then blink off, then periodically the formation will dissipate, as the orbs move away in varying directions, before darting across the skies and vanishing... and then one by one, reappearing again. I have never seen anything like this, ever. I observe this wondrous spectacle for approximately ten minutes, before the orbs gently glide away towards Oxfordshire and into the sunset. The question in my mind arises whether or not the orbs are anything to do with Croughton airbase near Bicester, as this is roughly the direction they fly towards as they fade from view. Annoyingly, frustratingly, my mobile phone had no battery charge in it, having run out of juice ten minutes into my journey over an hour earlier from Oxfordshire. Of all the occasions I've ever needed a charged-up phone, Grrrrr! The next day, I got in touch with the local police. I was doing my best to recount what I had seen to the officer on the other end of the phone. He politely listened, taking in what I was trying my best to explain... that is, until he asked me what my job was. With an ironic laugh I said that I was a science fiction artist... and then came the silence. Yes, Mr Policeman hung up on me; can't understand why. No surprise, but the same thing happened when I phoned the local newspaper. I tried to phone the Croughton airbase, only to hear bureaucratic waffle about filing a report and that they are not allowed to discuss such things, national security and all that. I even went there in person when I next happened to be near the airbase, but despite my best persuasion, no one would listen to me or see me. ​Apparently, only one in a hundred so-called UFO sightings ever get officially reported. My friends naturally thought I'd finally gone totally bonkers "It had to happen sooner or later" they'd say, "Danny has at last flipped. No surprise really; years spent creating aliens and now he thinks he's seen their mothership, poor Mr Flynn". Even my parents, who know I would not make something like this up, sounded skeptical. I went online - to hopefully find explanations, even if they turned out to be boring and ordinary. “Orange Orbs in the Sky” I typed in the search engine. To my delight I was not the only one who had seen orange lights. Better still, many people had uploaded video clips. Despite plenty of sightings and eye witness accounts similar to my own, I could not find one explanation as to what the orbs were, other than possibly being chinese lanterns, which they definitely were not. Lanterns are not usually the size of double-decker buses and do not fly across the sky at alarming speed. The next afternoon, my Dad phoned me. “Danny, me 'n your mum had a right good laugh last night after you telling us about your alien friends and their imminent Earth invasion... and yet, I think we may believe you... "Quick - switch on the radio”. It transpired that the orange orbs had also been spotted over Wales and Ireland, with many people phoning their local radio stations. I listened to eye witness accounts similar to my own... four orange orbs, blinking on and off, shooting across the sky, reappearing somewhere else... more or less what I'd seen the previous night. I tracked down the only book on the subject of the Orange Orbs written so far, "The Complete Story of the Worldwide Invasion of the Orange Orbs", by Terry Ray. Mr Ray is a former military pilot, and believes the orbs are of extra-terrestrial origin. He states his case with plenty of convincing evidence. He has a map of the USA with all the orb sightings, along with the accounts of hundreds of people who claim to have seen the orbs. Mr Ray suggests the creatures inside the orbs are gently preparing us as a species for an eventual "proper" definitive introduction at some point in the future, once most of us have heard about them. I don't know if what Mr Ray says is true, or even if I believe him. I respect that he, like myself, definitely saw the orbs and it affected Mr Ray enough to compel him to research the orb phenomena in detail and publish a book about the orbs. Mr Ray does not think the aliens are harmful or a danger to us in any way, the opposite in fact. If they really are alien, and can fly across the vast distances of space, it would seem they a quite superior to us, at least as avionics engineers. The big question is... why would they be here on Earth, and want do they want with us? I still often look up at the sky, in the hope of seeing the orange orbs again, but so far it has not happened. All I know is that back in the summer of 2010 I definitely saw something that cannot be fully explained. l feel quite privileged, honoured even, that I saw four orange "alien" spaceships. If Mr Ray is sure the creatures are harmless, then I only wish the aliens had chosen to meet me that night, especially as they must have been aware I was was watching them. I would have happily taken them to a pub for a few beers, and would have loved to see their expressions when I told them my profession was thinking up aliens. I'm not sure how I would have explained the aliens to the bar staff though, other than to say some strange friends had just dropped by to see me, from far far away. why do you wear odd socks? Because I can, and always have done. Even if I had ten legs, I'd still wear odd socks... yet during the summer I try and avoid having to wear socks at all, even on cold days - to give my feet chance to harden, in readiness for the long winter ahead. Yes I do. This is generally how it best works. First, I ask for a brief description of the sort of thing you're looking for - including the size etc, and especially how soon you need the painting by. I then get back to you with a rough estimate of the price and time scales. I would then doodle out some rough sketches of the intended finished painting. Once you're happy with the composition, and in agreement on both the pricing and the proposed painting, I would then make a start on the painting. At this stage, a third of the agreed price of the finished painting is required as a deposit. on detail and the time it takes to complete the painting. I always try to be fair with my pricing and hopefully affordable, yet the original paintings do take time and patience. If you would like your painting professionally framed, this can be arranged. I have an excellent framer friend who can do this for you at a reasonable, additional cost.